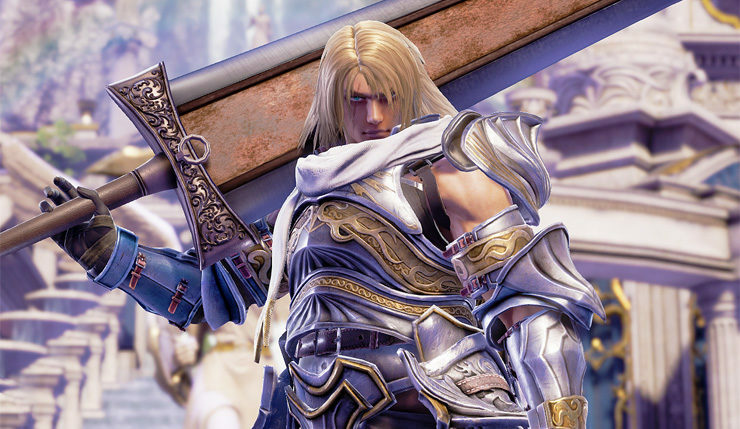 Soul Calibur VI is the sixth installment of Bandai Namco's Soul series, which began with Soul Edge and proceeded up to Soul Calibur V. The fifth entry in the series was controversial in many ways, gutting a large portion of the cast, sporting a rather lackluster story mode, and making its lead character a divisively unlikable man. It also featured the largest time jump in the series yet, aging up fan favorites like Siegfried, replacing other favorites like Taki with next gen counterparts like Natsu, and changing old fan favorites into other characters entirely, like turning Kilik into a mimic character. 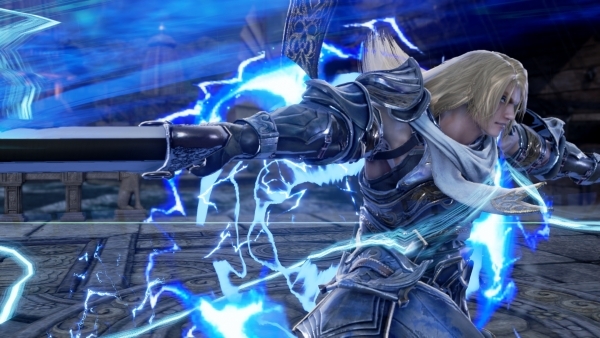 Perhaps due to backlash against SCV's direction, the sixth game aims to take the series' tagline literally, and retell the story of the first couple of Soul Calibur games. The team promises we will "uncover hidden truths" by revisiting this time period. What are those truths? I suppose we'll have to play to find out. Being set back towards the beginning of the timeline, the established characters are their more recognizable younger selves. In addition, we have several newcomers who were either originally introduced in entries that took place later in the timeline, or are brand new altogether. The game's story mode is called Soul Chronicle, which covers from the end of the original Soul Edge to the beginning of Soul Calibur II, spanning about seven years, from 1583 to 1590. Every character has a story told through voiced illustrations, which look absolutely gorgeous. In addition to Soul Chronicle, there is also a mode called Libra of Soul, which is a campaign of sorts for the player's own created characters. This mode incorporates RPG elements, and introduces an alignment mechanic, where you must make choices that bring you closer to either Soul Edge (evil) or Soul Calibur (good). The story culminates in a final battle against a new character created specifically for this mode, Azwel. Let's take a look at the Roster. Unfortunately, Tira will be DLC. Inferno is also not playable online. Because she got shafted from the base roster, I'll put her full artwork here. Look how gorgeous the character art in this game is! 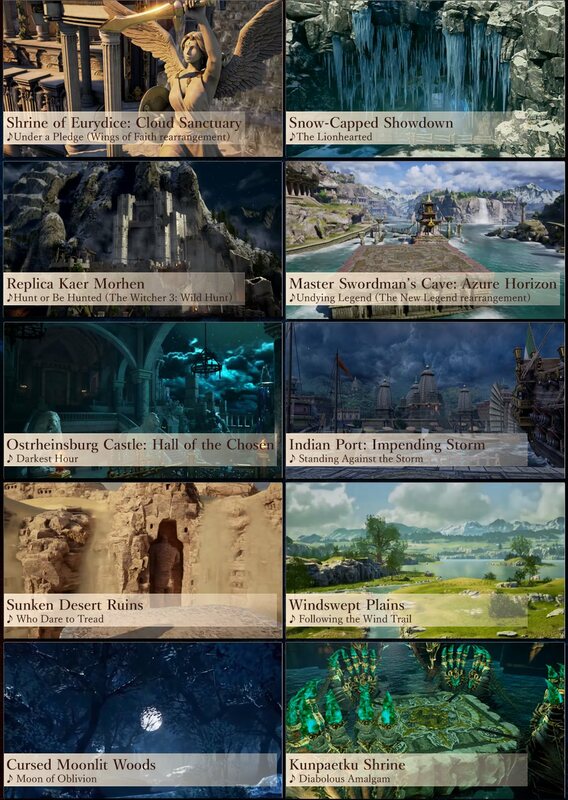 Here are the confirmed Stages. Returning from Soul Calibur V is the Create a Character system, which now includes sixteen (!) different races to choose from as well as humans, ranging from elves to automatons to lizard men. 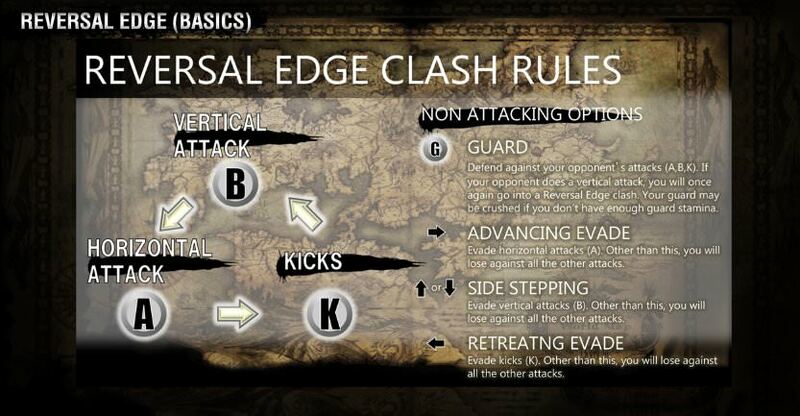 Introduced in this installment is the Reversal Edge system. Here are some diagrams to help you understand just what that is. For a very, VERY in depth look at returning mechanics, which include Guard Impact, Supers, Meters, and more, please take a look at this guide on reddit, uploaded by user Patroklos α. Much of what has gone into this thread was helped by this reddit thread, including the roster and stage list. The thread also has more details on just about everything else in the game, putting all pre-release info through a fine tooth and comb. In order to cut down on bloat, I'll leave the link here. And, if you hadn't noticed, Geralt of Rivia, of Witcher series fame, is in this game. They even put him front and center on the cover art. Soul Calibur is known for its guest characters, after all. The stage of destiny is set. Fight on, my friends. Good start, can’t wait for friday. God, another SC without Cassandra. My Taki is back, I am now complete. Man when I saw the OT go up, I hoped the game was about to release but then alas still this Friday. I can’t wait. 3 more days. This is out this week? Jesus, they did not market that release date well at all. Thought it was November or December for sure. Excellent thread. Heard the load times on PC are instantaneous. Good news to me! Nice to see that the stages are still as lovely as previous installments. Inferno is not available for online play. Just wanted to throw that out there for asterisk material, OP. Preordered and ready to play 00.01 on Friday. 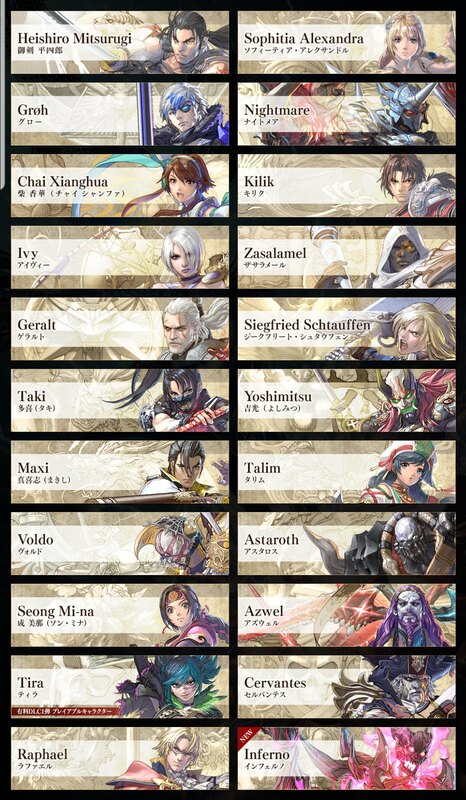 The official website has also been updated with all the the characters. Haven't played a SC since 3 but my soul still burns! Cant wait to finally dig into this. I'm just gonna dump this here. Will get my copy.in by tomorrow on steam. Finally, after such a long wait. Seems the betas was so long ago, I can't wat to dig into this game. The store I preored my physical edition said it should be availaible today or tomorrow, fingers crossed ! Started playing this with Soul Blade, never stopped since, managed to get my hands on all entries. My Xianghua is damn ready after the beta, but also my backups Talim, Mitsu, and to a lesser extent Nightmare and Siegfried. Can't wait for Friday - have really missed SC. Will be spamming Xingghua matches before diving into story mode. I’m in here because I like pain. Don’t quite know who I’ll main yet maybe Sophita, Yoshi or Talim who were my favs back in the day. I am so bad at these games now I am for sure going to be getting destroyed for months on end. Worth it? We’ll see (and really bloody hope so). Sigh, I wish I had time to play this. I’m in here because I like pain. I have mine preordered. Now to wait till Friday. Hoping for a download option Wed or Thurs would be nice. My housemates wanted to get into a new fighter. Previously it was KI, now I hope SC will have a good life and Community online. I hope SC will have a good life and Community online. Apparently SCV is still populated online to this day, VI should be fine. Fingers crossed ! Where is the CaS OT? Booo! Also, SOULCALIBUR is one word. Yeah, hoping it's alive and well! It's been a damn long time since SCV, only three more days to wait in the UK. I haven't played for so long I feel like I'll be starting completely afresh. Hope Raph is better in this one as he was my go to. I've got Maxi on backup though. Still on the fence with this one. Been playing the Soul Caliber games since the beginning. What the heck?! This game releases this week?! There's been barely any advertising at all!!! I'm gonna sub. I'm shocked this game is coming this soon. I thought it was 2019. This needs to happen! So does an online spreadsheet with all our usernames and platform of choice. Whoaa early OT. My Ps4 is ready! ... It releases this week? What? Oh well. I'll have to decide between this and Warriors Orochi. I think Soul Calibur will get the edge though. Its finally time again to return to the stage of history. But yeah I forgot about Warriors, Soul Calibur it is for me though because all my local friends are hyped for local-multiplayer! I'm mad hyped, Tekken's going on the backburner for this. Starting out with Mina, X and Tira. Man...I'm busy with ACO and Blops 4 but I've got all the parts for my arcade stick ready to be assembled and this is the game that'll make me get to it. I actually bought all the parts after playing DBFZ but dropped that game in a week and the parts remained unused. EDIT: Super hyped on Geralt by the way. Most excited I've been for a guest character since Link in 2.